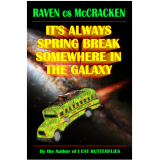 Follow the antics of The Misplaced, as they introduce the galaxy to rock and roll with Earth’s very first starship. Nothing stops this hardrockin’ group as they explore outerspace, with an in-your-face attitude. It's a rock and roll rollicking romp that's hilarious, has twists and dangers galore, and even a little romance, alien-style. It's one you'll read over and over again.